The annual Budget mela is under way, with the usual flurry of TV talk shows, conferences, statements about what to expect, and recommendations, mostly by policywalas in and around Lutyens’ Delhi. The crescendo will build upto Budget Day and then subside. The proposal, with growing and influential proponents, globally and in India, is for a Universal Basic Income (UBI). Cash transfers are increasingly replacing complex and wasteful indirect subsidies. The Rythu Bandhu scheme, paying mostly small farmers Rs 4,000 per acre for upto two crops a year, implemented in May 2018, contributed to the huge victory for the incumbent Chief Minister a few months later. With the big national election nearing, some huge spending schemes may be announced in the upcoming Budget. Freebies, whether good or bad, are invariably great vote getters. This article is not meant to discuss the pros and cons of UBI, or other grandiose direct benefit schemes, but to recommend a precise road transport policy. In daily urban lives, where the proverbial rubber meets the road, traffic congestion and the resultant cutting of trees to build roads, is a severe malady. The problem is more acute in Third World cities, including Bengaluru, due to the rising travel and living space needed for rural migrants. 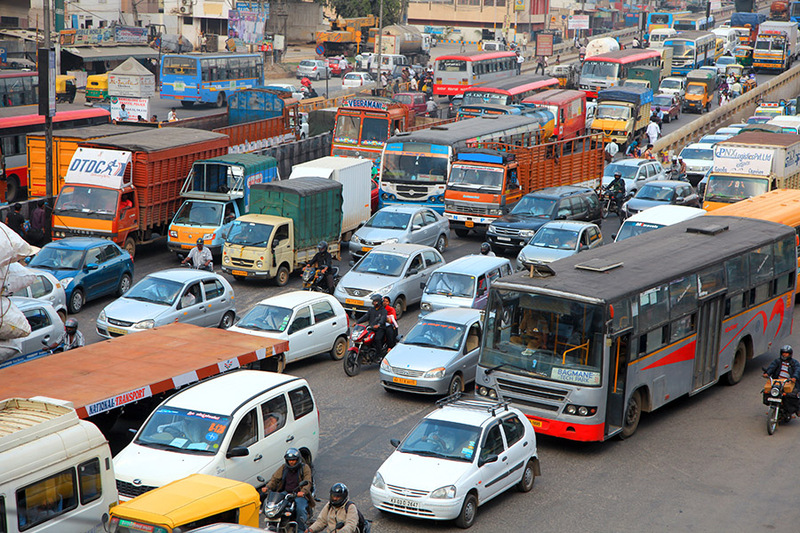 Congestion occurs because road space is free or very inexpensive. Cars will always expand to fill up the available road space. As I have argued in a series of articles posted on unclogroads.com, public transport by itself is not the solution. In London, despite its excellent Tube (the underground subway) and buses, average motor travel speed in 2000 was about 10 mph, similar to that of the horse and carriage a hundred years earlier! Tube ridership and travel speeds picked up after London, in 2003, introduced what can be called conventional congestion charging – stiff levies for entry into toll roads leading into the City. However, over time, road congestion has slowly built up and speeds have fallen there. Such conventional congestion charging – letting vehicle area be inexpensive, but charging for the use of the road – is a reactive policy. It does not curb the build up of vehicle area in the first place. Far better to charge pre-emptively and steeply for vehicle area, a policy that needs to be outlined. Suppose the area of my car, measured around its edges, is 5 square meters and the vehicle area tax rate is Rs 4,000 per sq m per year. Then I am required to pay Rs 20,000 per year as a Vehicle Area Tax or a Vehicle Area (Annual) Levy, or VAAL. The rationale for such a policy is that a car is not just a marvellous machine but also mobile land not paid for – unless parked on the owner’s premises. To modify a famous economic dictum, there should be no such thing as free, or massively underpriced, vehicle area. Ideally, VATAX should be on all motor vehicles. Providing exemptions for two wheelers and buses, or for categories of users (Government and/or personal, but not for commercial private ones, which is often the case) is likely to create distortions over time. These will negate the initial benefits. But for starters, the VATAX could be imposed only on cars. Further, ideally it should be revenue neutral, which means the collected amount should be offset by reductions in other taxes. The goal of VATAX is not for the government to grab more money from the public, which it tends to spend wastefully. Instead, the goal is to reduce congestion and associated ills by curbing vehicle area, or at least its growth. To take the above example further, I should be charged Rs 20,000 as VATAX only if the other taxes I pay are reduced by equivalent amounts: the lifetime tax, excise duties etc. If there is any surplus, which will be the case with a stiff VATAX rate, the surplus should be returned as an income tax rebate. Reducing excise or equivalent taxes on petrol, which are very high in India, could also be done. I prefer to call it VAAL and not VATAX, to convey the view that it is not a tax in the conventional sense of the word, but merely a levy or a user charge. Such a revenue neutral VATAX is unlikely. Governments are likely to use it to raise more revenue, instead of in a strict revenue neutral way. Even if not revenue neutral, the policy will still be beneficial since it will reduce vehicle area and thereby the amount needed to be spent on infrastructure – specifically, on building roads to accommodate extra vehicle area. As a practical matter, it is very hard to tax vehicles which have already been bought and on which the Lifetime Tax (LTT) has already paid. It is more feasible to impose VATAX as a surcharge on new cars, without lowering other taxes. In Bengaluru, this can be done right now by diverting the revenue to Bangalore Metropolitan Transport Corporation (BMTC) which has been facing a substantial revenue loss for 2018. It is reportedly planning to cut loss making routes and/or raise bus fares. These fares are steep anyway and the hikes would hurt the poor riders. This suggestion regarding BMTC was provided to me by Mr. DT Devare, who has been working with the Bangalore Environment Trust, and writing to various authorities on such matters. As per his data, based on top ten new cars sold in India in 2018 upto November, if an estimated 5% of them had been sold in Bangalore, about 79,000 vehicles would have been sold here. With average area per car being about 6.57 sq metres, total new vehicle area sold was about 5.17 lakhs sq meters. If the one time VATAX surcharge is Rs. 4,000 per square metre of vehicle area, then Rs. 206.9 crs revenue can be raised in 2019, for these values. This would plug BMTC’s shortfall without closing loss making routes or raising fares. A one time surcharge on new vehicles sold is legally much simpler than a regular VATAX on all vehicles. The latter is a desirable long term goal which would require various legal changes involving the Motor Vehicles Act and other fiscal matters. In suggesting VATAX, I concluded my first article in 2006 by stating that it is a policy, “whose time has come, locally and globally”. Given the changing urban landscape in Bangalore, which almost looks like a war zone in some places now, such a policy is long overdue. In short, an area surcharge on purchase of new vehicles in 2019, instead of raising bus fares, would be a good beginning in many ways.